It’s so important to keep an open mind so you can learn. Most people naturally have a strong emotional response to the domestication of Thai elephants, but it’s good to also have an informed one. Chains, for instance, are often presented as unethical. But skillfully used chains actually benefit elephants. The mahout cannot be with his elephant 24 hours a day, so when he is resting, the elephant is chained. Without large, expensive enclosures, chains are the only measure of protection to ensure the safety of both humans and elephants. Otherwise, elephants attack each other, get hit by cars, electrocuted by fences, injure/ kill humans and destroy crops in neighboring farms. 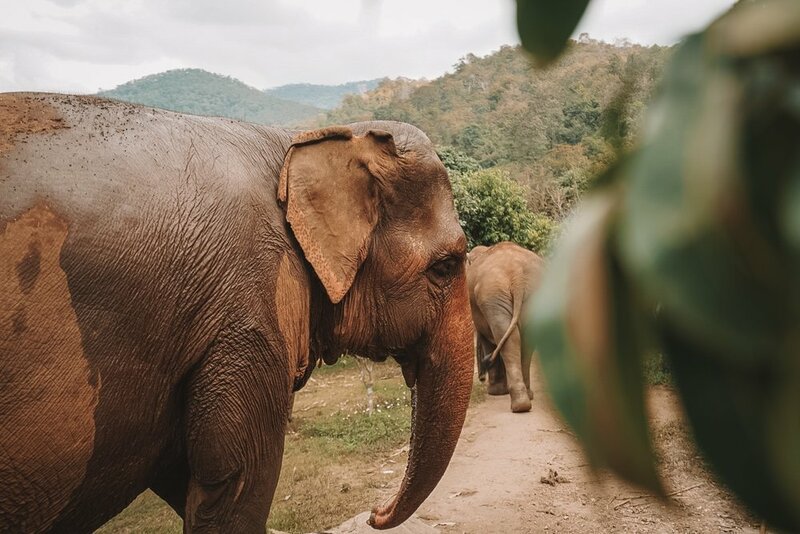 At night elephants are tethered with long chains of up to 20-30 meters, enabling them to be constantly moved to new natural food sources and to graze within a large circle defined by the length of the chain. Additionally, metal chains are the best tether for an elephant, as it does not chafe their skin like nylon or cotton rope. Thank you so much for supporting us and what we’re trying to achieve here.